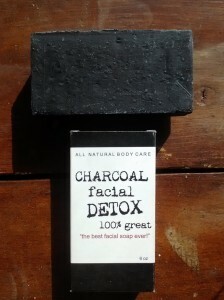 I never thought about charcoal on my face until I discovered ‘Destiny Boutique Charcoal Facial Detox’. It might sound kind of dirty, but I went with it anyways. This soap was truly interesting in look, feel and washing qualities. This soap bar weighs in at a hefty 6 ounces, black in color and it is handcrafted. If you have small hands you might actually have a hard time holding on to it (cut it in half). I used this soap solely on my face because Destiny Boutique claims, on the packaging, “the best facial soap ever”. Unfortunately, I will have to beg to differ . The truth is that this facial soap is really nice except for one little thing. When you use the soap bar directly on your face it will scratch you a little bit. It took me a while to figure out why I had little scratches on my face. At first, I thought I was scratching myself in my sleep. It turns out that this soap has a gritty, scratchy texture when used directly on soft facial skin. The best thing to do is, foam up the bar in your hand then apply soap suds to your face. This will melt away the grit. I really enjoyed the smell and the effects of Peppermint and Tea Tree oil combination. Both these ingredients will activate your smell senses early in the morning. It’s kind of like an overall facial blast of Vicks Vapor Rub, hence the Detox sensation. Also, the fact that this soap is all natural with no crappy ingredients makes this a worthy facial soap. INGREDIENTS: naturally occurring glycerin, sodium cocoate (coconut), sodium palmate (palm), sodium olivate (olive), sodium soybeanate (soy), argania spinosa (argan) oil, raw and unrefined butyrospermum parkii (shea butter), mentha piperita (peppermint) essential oil, activated charcoal, hydrolyzed wild cruelty free tussah silk fibers, melaleuca alternofolia (tea tree) essential oil.